kt literary » Blog Archive » Happy Book Birthday to Michael Underwood! Happy Book Birthday to Michael Underwood! Please help us congratulate Michael Underwood on today’s release of THE ABSCONDED AMBASSADOR! Fiction is more important than you think. 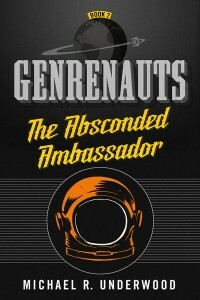 When stories go wrong, the Genrenauts step in to prevent the consequences from rippling into our so-called real world. When a breach is discovered in Science Fiction World, rookie genrenaut Leah Tang gets her first taste of space flight. A peace treaty is about to be signed on space station Ahura-3, guaranteeing the end of hostilities between some of the galaxy’s most ferocious races, but when the head architect of the treaty is unexpectedly kidnapped, it’s up to Leah and her new colleagues to save the day.